Dr. Magnus Callavik was born in Sweden 1969. He graduated from the Royal Technology of Technology in Stockholm (MSc 1994, PhD 1998), and was a Research Fellow at Stanford Research Institute in California during 1994. He has a MBA from Stockholm School of Economics and is a certified project manager professional (PMP). He has worked at ABB in areas related to power and automation since 1999 in various R&D management positions. He has worked in university cooperations such as the European Institute of Innovation and Technology. He has been following the Royal Seaport Smart Grid project formulation and prestudy during the last years. 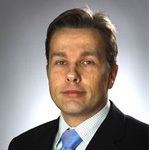 Since 2010 Magnus Callavik is working at ABB Grid Systems as program manager for HVDC Grids.